On May 1, voters in Newport News will elect three members to city council. 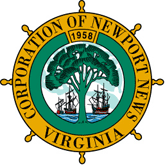 Newport News employs a ward system. Newport News also has a school board race. Three districts are up for election. Click on the candidate’s name to access their websites, where several have links to their Facebook pages. Note that * = incumbent. Vivian renewed her offer to the candidates to submit an article for publication here about why you are running and what you hope to accomplish. Use the Contact Me link to do so.